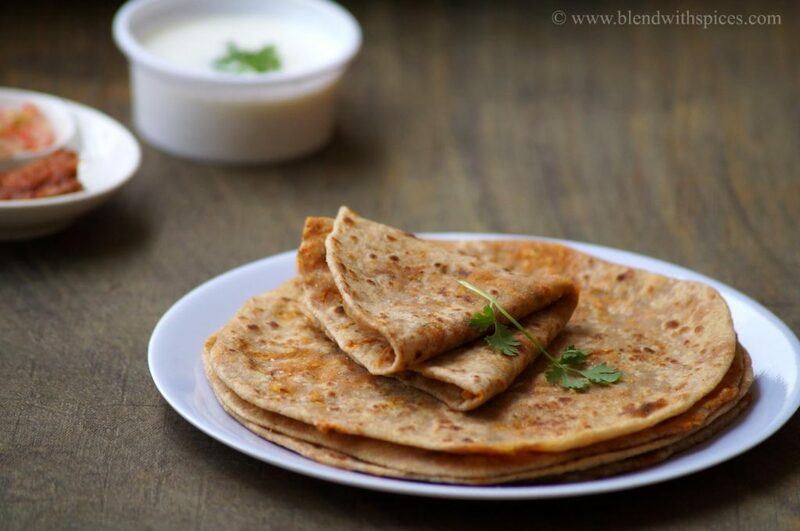 If you are looking for more breakfast recipes then do check Methi Paratha, Bidari Paratha, Gujarati Panki, Masala Pav, Aava Pettina Daddojanam, Paneer Pav Bhaji, Lemon Sevai, Methi Poha and Makki Ki Roti. Take the wheat flout, salt and a teaspoon of oil in a mixing bowl and combine well. Add water little by little and knead into a soft and pliable dough. The dough should not be too tight or too soft. Cover the dough and keep it aside till you make the stuffing. Heat 2 teaspoons of oil in a pan. Add the carom seeds and fry for a few seconds. Add the grated carrot and fry for a couple of minutes or till the raw smell leaves. Add the coriander powder, cumin powder, garam masala, turmeric powder, salt and red chilli powder and mix well. Sprinkle a very little water and cover it with a lid. Let it cook until soft and well cooked. Open the lid and saute till it becomes dry. Add the coriander leaves and combine. Divide the prepared dough into 5 equal portions and set aside. Divide the carrot stuffing into round shaped balls and set aside. Roll each dough ball into a thick circle, place the carrot stuffing ball in the center and bring the edges together and seal it. Dust some flour on the board and roll it into a thin paratha. Heat a pan / tawa. Carefully place the paratha on the pan. 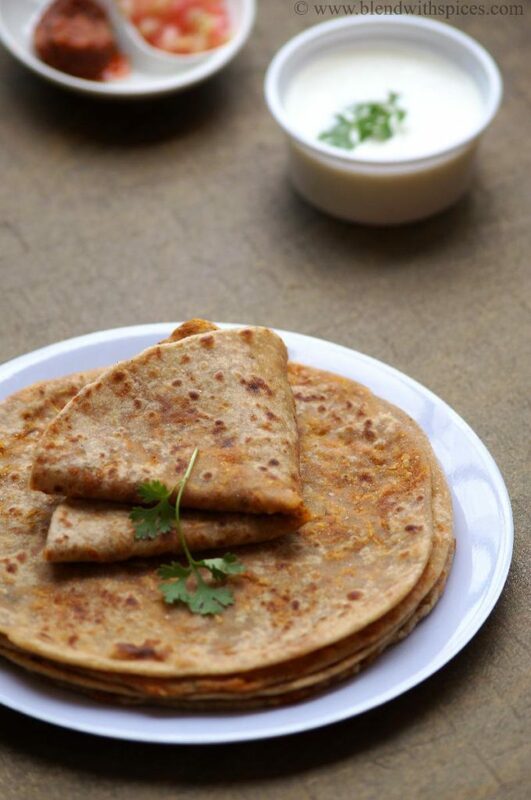 Drizzle some oil and cook the parathas on both sides until brown spots appear. Remove from the pan and keep it in a bowl or roti basket. Keep covered to maintain softness. Serve hot with plain curd / raita and pickle.